Payable in cash only, this includes temporary membership and coaching for the 4 sessions. Suitable for ages 16 and up. Maximum weight of 110kgs. All equipment is provided and you will receive 4 weeks rowing experience led by a qualified club coach. Safe & fun way to learn basic rowing skills. Row on the River Lagan. You need to be confident around water and be able to swim 50 metres in clothing. We do not wear buoyancy aids. This four week course for beginners is aimed at improving your basic rowing skills and confidence in a fun and safe way. There will be four course start dates to choose from all running for 4 weeks. During the course on a rowing machine and in a boat balanced by others you will learn to use your legs, trunk and arms in sequence to move the boat, to keep in time with others, and to help with balance. You will also handle the boats and learn to launch, turn, stop, and recover the boats. 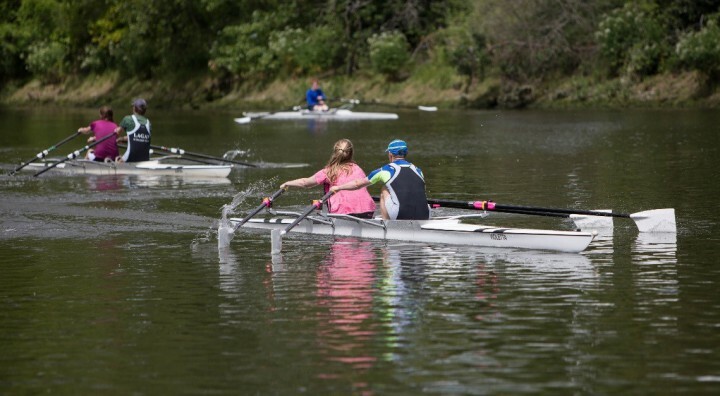 A great way to get into the fantastic sport of rowing, meet new people and learn new skills. Please email name and contact telephone number for each participant, with preferred start date, to lscullers@hotmail.com and await a reply to say you are accepted. During each sessions you will spend at least 15 mins on the rowing machine, and at least 45mins in boats rowing, and all 90 minutes learning! Boats and equipment are provided, along with coaching. No equipment needed. Wear t-shirt and leggings, not loose, and outer layers to suit the weather, and trainers (not your best runners). Bring a kit bag with a bottle of water/diluted cordial, towel and change of clothing. Minimum age 16, maximum weight 110kg. You need to be confident around water and be able to swim 50 meters in clothing. We do not wear buoyancy aids. Flexibility and balance will be required to succeed. Rowing uses the legs, core, and arm muscles.